Crochet Pattern Central. I have lost track of how many hours (yes, hours) I have spent on this Crochet Pattern Central’s online directory. Projects are sorted by categories to help make your search a little easier. Ultimately, you’ll be able to link to the page where the pattern is housed. The only downfall is that you only have the name of the pattern to go off of, so you might spend some time clicking on multiple links before you find something that’s close to what you’re looking for. All Free Crochet. Similar to Crochet Pattern Central, All Free Crochet has patterns sorted by categories. Once you’re in a category, you can sort alphabetically, or by most/least recently added. Plus, you’re able to see a picture of the project in the results. Another great thing, is that this website offers a “Tutorials” link which is always helpful for beginners. Craftsy.com and Ravelry.com. Online social networking communities are great places for fiber artists to collectively share their patterns. Some patterns might come with a small fee but there are plenty of free patterns available as well. 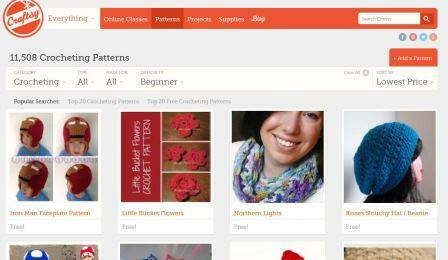 On Craftsy, you can sort by craft type (so, crochet); then you can sort by difficulty. If you do an additional sort by lowest price, the free patterns will be listed first. On Ravelry, you’ll have to create an account before you’re able to search for patterns. Many yarn companies, have their own websites and host their own free patterns. My favorites include those by Red Heart, Lion Brand, and Yarnspirations.com. The last one is a unique one because it’s the collective home for yarn brands Bernat, Caron, Patons, and Lily Sugar ‘n Cream. The great thing about Red Heart and Lion Brand is that they also have apps you can download so you can search for patterns from your smart phone device. One of the great things about searching for patterns on Youtube, is that many designers will post videos to show you how to crochet a project – great for the many of us who are visual learners. Two of my favorites include Maggie Weldon’s channel and Crochet Geek by Teresa Richardson. There are so many of us out there and a lot of us like to share what we do and will gladly offer free patterns. Searching through Ravelry, Craftsy, and even Pinterest, you’ll find that a lot of those patterns are offered by fellow bloggers. Another way to find them and their free patterns is by doing a Google search; no, really, just Google them. 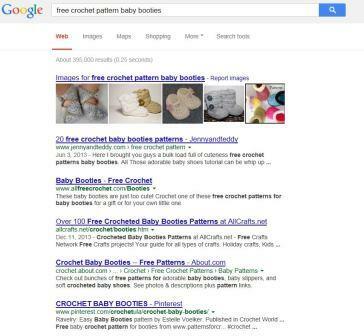 A search such as “free crochet pattern baby booties” will give you many results, most of which will lead you to a blogger’s page. Where are your favorite places to search for free patterns?